The Roman Catholic Church apologised today when it was found that horses had appeared in crib scenes in place of oxen in 100% of the churches tested over the 2012 Christmas period. 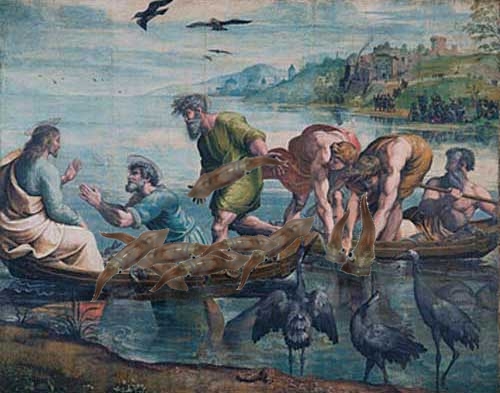 Raphael’s Sistine Chapel tapestry would have to be reworked to create a “squid-wranglers of men” scene. Experts from the Vatican’s Congregation for the Doctrine of the Faith have expressed concern about Pontifex’s next Christmas book which is set to claim that 1st century fishermen in Galilee mainly fished for squid and therefore key Gospel passages will need to be rewritten. Catholics worldwide can expect new translations of the New Testament which include accounts of the feeding of the 5000 using squid and loaves and the first disciples being called to become “squid-wranglers of men”. Meanwhile, manufacturers of Ichthus badges are already retooling their machines to allow for effective replication of squiddy tendrils. This entry was posted in Funny articles and tagged catholicmemes, findus, horsemeat, pontifex, pope, Roman Catholic, squid by masterofthememes. Bookmark the permalink. and within 24 hours the Pope quits. You saw it here first!